I expressly grant permission to reproduce copies of this graphic in any media, digital or physical, as long as it is reproduced “as is” and in full. Feel free to share it in blog posts, presentation slide decks, reports, or any other vehicle where you would find it helpful. I want to acknowledge the key sources of data I used in my research to build this graphic: CabinetM (who was kind enough to give me a report of their whole database! ), Capterra, G2 Crowd, Google, Growthverse, LUMA Partners, Siftery, TrustRadius, and VB Profiles. I used these services both to discover new marketing tech companies and to triangulate my categorization schema. As always, I owe a large debt of inspiration to Terry Kawaja, the godfather of vendor LUMAscapes. 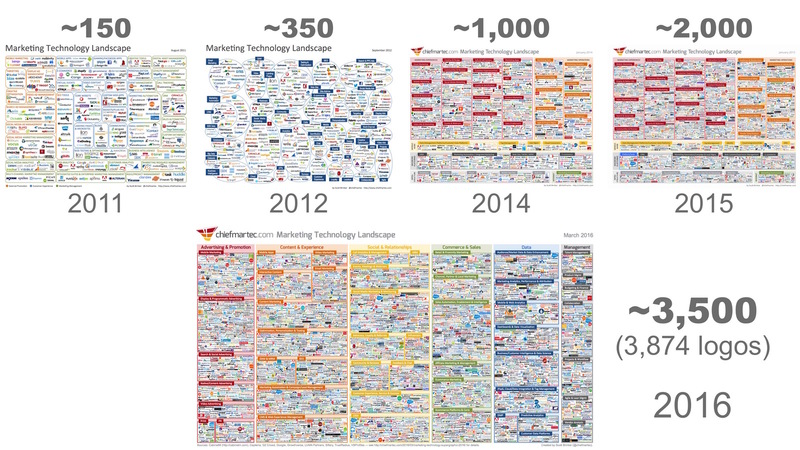 As mind-boggling as it is, the marketing technology landscape grew even bigger. I’ve fit 3,874 marketing technology solutions on to a single 16×9 slide — almost twice as many as last year. I say “solution” instead of “company,” because some companies are included multiple times in different categories. The big enterprise software firms — Adobe, Google, IBM, Microsoft, Oracle, Salesforce, SAP — have the most instances of their logo on the page, but there are others too. I loosened my restrictions on “one logo per page” a little bit to better reflect vendors who sell solutions in many categories across the landscape. But given space constraints, I was still pretty miserly about putting most companies in only one category — usually the one that seemed to be primarily represented on the home page of their website. I estimate the de-duped count of logos is closer to 3,500 — approximately 87% growth over last year. That’s really amazing when you consider how large the landscape was last year already. You can view and read about the earlier versions of the marketing technology landscape here: August 2011, September 2012, January 2014, and January 2015. Note that these are not stricly apples-to-apples comparisons. In each landscape edition, I have adjusted the categories — added some, removed some, redefined others — and varied my heuristics for inclusion. We’re living in a rapidly changing industry, and I treat this landscape as a living document that continues to evolve to the environment. In particular, for the 2016 edition, I removed most of the “infrastructure” categories that were in the 2014 and 2015 editions — databases, cloud infrastructure, big data, web dev — because while they’re important to marketing, they’re more general purpose in nature. And I really needed the space. But I also added new categories. I know, most of these categories are extremely broad. You could do an entire landscape solely on the subcategories within content marketing (and, indeed, people have). My goal with this landscape is to give you the 50,000-foot overview of the entire space — which forced a trade-off with granularity. This year I restructured the entire way the landscape is organized. The 2014 and 2015 editions were laid out with a kind of “stack” metaphor — infrastructure and platform systems at the bottom, experience and operations applications on top. This represented my belief that marketing technology would logically coalesce around a single platform in any given organization — with a small oligopoly of platform providers competing for that starring role — which would then be augmented by a collection of more specialized applications that would plug into that platform as third-party solutions. Instead, many companies have multiple platforms in their marketing technology stacks. It’s not unusual for them to have one vendor for their web experience platform, a different one for their marketing automation platform, another for the CRM, and so on. Almost every vendor in the space has invested engineering resources in making it easy (or at least easier) to integrate with the rest of the marketing technology ecosystem. Most marketing tech products now come with plug-and-play support for the major CRM and marketing automation platforms. The category of products known as iPaaS (integration-platforms-as-a-service) — along with new generations of tag management and other “marketing middleware” solutions — has grown significantly, making it easier to connect most or all of an organization’s marketing technology to a common data exchange backbone. This has empowered marketers to select “best of breeds” solutions and avoid vendor lock-in with a single marketing technology provider — and, indeed, many are now successfully embracing that more open and heterogenous approach. With many of the marketing teams I’ve met with, these seem to be the clusters that most often divide key vendors in a multi-platform environment. It’s also where practice expertise — the skillsets of different marketers and marketing technologists — seems to vary the most from one cluster to the next. I’m sure many people will have opinions about this new landscape, and there will be a range of theories about its nature and its future. But with all theories, however — mine as much as anyone’s — I would just caution that this is a complex space. Visualize the interference pattern of many waves colliding together. There are many different forces acting on this space in parallel — accelerating digital disruption across the whole of humanity as the massive, overarching one. As a result, I believe it’s hard to fit everything into a single, simple explanation. P.S. In addition to my role as editor of chiefmartec.com, I’m also the co-founder and CTO of a marketing software company myself — ion interactive, which makes an interactive content platform for marketers. Naturally, my own company is included in this landscape graphic, but only once. You can find us in the upper left corner of the Interactive Content category box. I’ve also included every competitor that I’ve ever heard about in that category box as well — 101 of them, by my count — in the interest of keeping this graphic as neutral and as unbiased as possible. Have you considered making the database behind this public? It will be immensely useful to create some apps and analytics around it. We provide a giant logo database + formatting tools that make it easy to create logo outputs for presentations. You could even create an output with as many logos as Scott’s! Scott – Once again, well done. I’m glad you kept Black Ink ROI software its rightful place with Marketing Performance and Attribution category. Thank you. Maybe you can convert this into a live Twister event at MarTech? 🙂 Good luck at the show. Scott, It is not an easy task to categorize 3500+ vendors. Appreciate the effort you and your team have made to inform & educate the fraternity. You have kept few acquired companies (for ex. Data Song got acquired by MarketShare and then MarketShare got acquired by Neustar) as independent logos in Marketing performance & attribution bucket; would love to know your thinking behind that. Scott, WOW! Really appreciate this post and you having taken the time to put some context around the numbers. Thank you. It is terribly important for marketers to keep up to speed but with some 3,800+ products and services listed here the size of the challenge appears vast. I would certainly see value in building a database service with reviews and case studies. Excellent output. Let me add to the congratulations for the latest version of the Marketing Technology Landscape. As a marketer this scares the pants off me! I have a limited budget to invest in technology. Where do I invest? What is going to give me the best bang for my buck? What technology will allow me to create engaging customer experiences, and be able to demonstrate a compelling ROI and increase the lifetime value of my customers? It seems the multi-platform over point solution is building a compelling case, but life was easier back 2011! Thanks Scott! I have been looking forward to the release of this every year for the past three or four. I love to see how Martec is changing and evolving, and appreciate your commentary along the way. I second Abhay. Would love to see the data behind this in a spreadsheet as searching some of the more dense categories can be difficult. That is an incredible graphic. Just the mere fact that you categorised them all so neatly is pretty amazing, let alone putting all 3500+ marketing logos in one graphic…that really tops the lot. I bet you didn’t think this was going to be the case when you first started this ‘small’ project. Great work. Thanks a lot for this big picture. I just started in the IM world and is a little bit overwhelming when you realize the tons of apps and programs you have to deal with. Missing ION Brand Soulmates in Influence but otherwise, comprehensive! +1 for making the database public, so we can create an interactive version of the tool (or at least we can filter on what technology we are interested in and get links quickly). Thank you Scott! This is truly appreciated! Thanks Scott for publishing this. Great resource as always. Can only imagine the effort that has gone into it to collate and reference 3500+ players. Thank you this is amazing scope to see all the marketing tech platforms. I would love to see top 10 market share of these service platforms in all categories. Is there any link or publication about this information ? For the next version of the supergraphic please consider also http://www.trendemon.com. We fit in the “Content Marketing” area within the “Content & Experience” category. Wow! Great job! Happy to see Catvertiser.com listed on your landscape. Thanks for highlighting ‘FirstHive’ under “Advocacy, Loyalty and Referrals” category. Could you add under Audience/Market Data & Data Enhancement, RedBase Interactive (http://redbaseinteractive.com/) and under Sales Automation, Enablement & Intelligence add SalesStaff (http://salesstaff.com/)? Thanks for this, great info if not overwhelming. Great graphic. But I think Zoho should be added to Email Marketing (Zoho Campaigns), Collaboration (Zoho Docs, Zoho Writer, Zoho Show, Zoho Sheet), Projects (Zoho Projects). +2 for public database. thanks for the effort on this. Fantastic work! You might consider adding http://www.sprooki.com in mobile marketing for it’s mobile-first customer engagement, messaging and commerce platform. +3 for the open database. And thank you for placing Azavista on the landscape for the first time. We are honored to be on it and looking forward to be on it for many years! You might consider adding Exponential Interactive (http://www.exponential.com/), Exponential unified it’s display, video and mobile advertising divisions (Tribal Fusion, Firefly Video, Adotube, and Appsnack) at the beginning of 2015. Great report! Please consider adding glispa http://www.glispa.com/ to the mobile advertising part in the future editions. Thanks! This is so valuable. I’m going to build some in-house activities around this chart and also doing our own marketing tech stack. It’s going to be a really good internal communication tool and we might learn a few things about ourselves. Zoomph is both a 360-degree Social Media Marketing & Monitoring platform in addition to Influencer Discovery platform. Awesome slide!! Incredible data. Are you making the back end available, or a spreadsheet for searchable logos? Great Work Guys – Really well done. I love the logic and R&D behind it. So many things and ways to view this data! Great work again! Thanks for sharing too! It’s really compelling to see the new ABM category take shape! Should act as a bridge between ad tech, content, marketing automation, and CRM. Reminds me of the Law of Accelerating Returns. Good stuff! I definitely agree with your viewpoint on the shift towards multiple vendors and your 6 marketing technology capability clusters organization. This is remarkable, Scott – and remarkably valuable. Thank you for sharing with all of us. We will give you MASSIVE credit and attribution when we use this in our training and keynotes – which I’m sure we will! A fantastic ‘ready-reckoner’ for a variety of uses. An absolute must for any and all marketing technologists out there. Kudos on the painstaking effort,Scott. Great work Scott and thank you for that! I can’t imagine your patience for puting all the logos. 🙂 Maybe you could have more data about AdTech in the future (DSPs and SSPs and more). Again thank you for that. I’d like to add my congratulations to another valuable graphic well-done! Thanks for creating this each year, it’s helping drive a much needed conversation and you’re doing a fantastic job. I’ve also noticed in the comments that 100’s more companies are requesting to be added next year! While you’re at it, would you please consider adding Syndeca Platform (syndeca.com) to the Interactive Content category? Great article and work on the ‘supergraphic’! One question: are ad verification vendors somewhere? I can’t seem to find them. If not, I will just mention that they are an increasing part of our decision making in media. Impressed with the choice of tools available. Would you be coming out with recommendations on and USPs of the best of these tools to help someone like me to make an informed choice to use them? We should also be in Marketing Automation… Thanks and have a great day. 1. I’m also a +1 for the database, or at least a listing. 2. Please consider adding Bell Litho Internet Solutions to the Marketing Automation space. This is so impressive! Wow! Thanks for sharing. You should add http://www.iadbox.com, a new digital channel for user engagement and profiling, and app/mobile website monetisation. Thanks again! This is awesome Scott, thanks for all your hard work! I do see that Automotive Digital Marketing for car dealers is missing altogether- did you know that the automotive industry is #2 in digial spend? Also, our automotive division http://www.AutoClimber.com represents AutoSaver.com (new MarTech Platform for auto dealers and car shoppers) please consider for future updates! Thanks again Scott! Hi Scott, unless I am holding the wrong end of the stick, which is entirely possible, I am missing a whole segment which becomes increasingly important: Competitive Intelligence with some crucial players like CID, Comintelli, M-Brain, Digimind, ClearCI, CI Radar, Management Monitor, Wide Narrow, Shift Central, News Edge, Mira … just to name a few. Did I miss them? It would be great, if you could add Ingenious Technologies (www.IngeniousTechnologies.com), specialist for business analytics and marketing automation and winner of the category ” Best Performance Marketing Technology” 2016 to your overview Martech landscape. Thanks Scott. Really great work. Great piece of work! Maybe my eyes are getting old, but I am missing http://www.podio.com (Data Management Platform?) and http://www.converve.com in Events, Meetings and Webinars? Can’t believe I’m just coming across this now! Excellent resource and a great way to identify new vendors. I would love to add another for consideration in 2017 in the Optimization, Personalization and Testing category. TravelTime – an API that searches and maps location data by time rather than distance to increase web conversions up to 300% http://www.traveltimeplatform.com/ . Hi Scott – this is a great piece of work. Do you have definitions for all of the sub categories in the model? Hi Scott! I’m curious where TCMA (Thru Channel Marketing Automation) or CMMP (Channel Marketing Management Platforms) live in your view of MarTech. Thanks!! Per your suggestion, I’m posting a note to include our social media analytics and reporting tool Zuum in the 2017 edition. Our URL is ZuumSocial.com, and we’d go in the Social Media Marketing & Monitoring section. Scott – Advocacy Marketing is an up and coming space. The company Customer Stories is an intelligent customer reference platform (https://customerstories.net). It’s new and growing fast. Awesome work Scott. You choose to add 101 of your own competitors. Bow to you. I am the founder of Promoto (http://www.promoto.co). We are a B2B Advocate Marketing company. We apply A.I. (Predictive Analytics) to identify potentials Advocate upfront. We are cross between A.I. X Advocate Marketing X B2B. Please do consider us for 2017 landscape. Thanks in advance. Excellent job and not an easy task to organize & categorize such an extensive list. I like that you also took the approach of solutions vs. vendors. I, too, like many others would love to see your database and criteria for categorization. Thank you for the efforts and making this public! Hi Scott! We can’t thank you enough for the tremendous work that goes into these charts. As we take on the incredibly ambitious moonshot to deliver a universal martech platform for SMBs, this type of robust research and enlightened insights are incredibly valuable on our journey. Thank you! CRM/ERP? and I would take a look at ERPNext which is probably the biggest Odoo competitor at the moment. I don’t work for them. Great work, it’s going to take me ages to highlight all the open source ones. Scott, amazing as always, and looking forward to the 2017 edition. Please consider adding tatchi (@tatchiapp – http://www.tatchi.io) to the retail & proximity marketing category. Thank you! I would like to ask you to consider adding to the upcoming 2017 – Marketing Technology Landscape: TrenDemon (http://trendemon.com) to the Marketing Analytics, Performance & Attribution category. We will be happy to join your much-sought Marketing Technology landscape 2017 under ‘Predictive Analytics’ category. And do you have the analogous graphic for 2017 yet – even in draft? Is it me or there’s not StackExchange? I’m looking forward to the 2017 version. Do you have any indication on when it’ll become available? I don’t blame you for the irregular release pattern. Lots of logos to go through! Advo.Ninja is an innovative employee advocacy platform with advanced personalization and deep text technology. Please consider us for 2017’s landscape. Can’t believe I’m just coming across this now! Excellent resource and a great way to identify new vendors. I would love to add another for consideration in 2017 in the Optimization, Personalization and Testing category. Thanks for this.